So, my 2003 Trailblazer with a 4.2 has had the common piston slap ever since I've owned it. The noise would go away when the engine warmed up but the past few months it got to where the noise never really went away. I took the valve cover off a while back and some of the lash adjusters seemed weak so I changed all of those. Everything else in the valve train was fine. That didn't help. I took the engine out this week and tore it down. I found that three pistons were scuffed pretty bad but only on one side. The rings on those three were stuck so I'm thinking that the piston was tilting too much in the cylinder bore. I'm going to go get the cylinders bored and oversized pistons for it. The main and rod bearings have little to no wear on them. I'm doing a full rebuild. I'm taking the block and the head to the machine shop Monday and hopefully have it back by the end of the week. I can get up to .50MM oversize pistons for it. I think that anything over that is too much. I talked to the machinist that is doing the work and he isn't going to take out any more than he has to. If it is over .50MM then we will look at other options. I don't trust engines out of salvage yards even with low miles. I have already ordered most every part except for pistons and rings. I bought Fel-Pro bolts. I've used them on every engine I've worked on and never had a problem with them. I'm not sure which bolt you're talking about that is $45 each but I'm only getting a price of $205 from the dealer for all of those bolts. I spent a little time today removing the broken head bolts. I used a screw extractor that you drill a hole in the bolt and then drive a little stud in and then use a nut on the stud to turn it. They came out without any trouble. So Far...So Good... 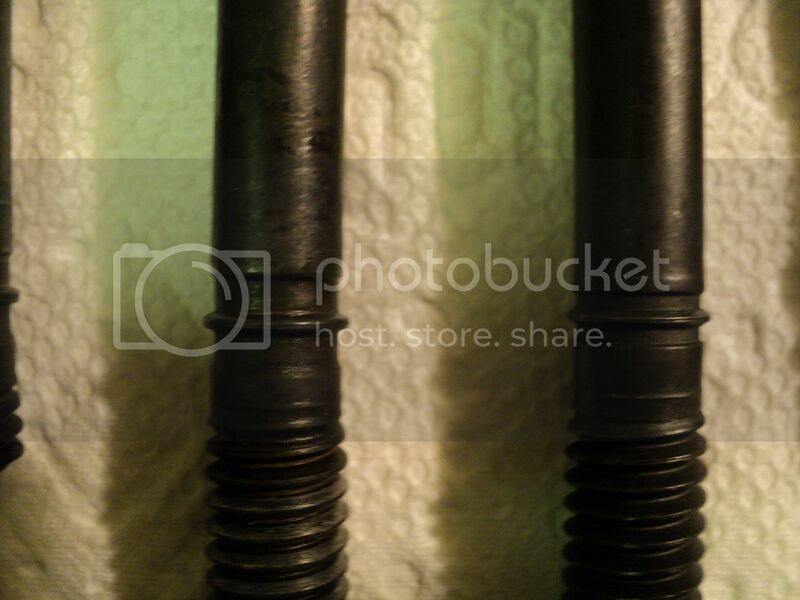 The aforementioned $45.00 Price Per Bolt was a Worst Case Example as a listing on eBay. But these were GM OEM Factory Fasteners that the "Stealerships" or the LLCs that buy out failed dealerships' stock and stores enmasse and then sell their repair parts and components at premium prices ... this is the source of this empirical information. If time permits and you can post more of your Reassembly Progress Images, they will be enormously helpful to others in the future. This repair/rebuild is not a commonly held experience with these motors... so anything and everything that you contribute here will be memorable, useful and much appreciated by your GMT Nation Brethren. An example of this is the questions that comes to mind as to what caused those three cylinders and their pistons/rings to become so badly scored in the first place...and if possible... figuring out what can be done to prevent this from happening again. I will do what I can as far as pictures and procedures. The engine is at work and I'll take some pictures of it torn down on Monday. I have a theory about the scuffing. The first one would be that it was overheated at some point. I've only had it for two years and I haven't run it hot. I have put 30,000 miles on it and it didn't start knocking until last winter. I living in Wisconsin so it gets pretty cold. The pistons have a coating on them to help them not scuff the bores. If it was run hot then some of that could have been rubbed off. Since it is so cold here it takes longer to warm the engine up. The longer intervals with the engine running colder with the coating worn off eventually got to it. I don't really know what else it would be. All of the rod and main bearings were fine and none of the rods were bent. Here is the specification from the manual. I would say if you see 0 or below often to swap to a 0W30 oil. It was very easy since the engine was out. I broke five of the head bolts even though I used a brass punch and hammer to jar them before I took them out. I got them out pretty easy but most of them were on the back of the engine. It wouldn't have been very fun with the engine installed. The timing chain was easy but the oil pan has to come off to change it. I rebuilt my front differential last year and I had to take the pan off to do that. Not a fun job. I think what I would try if I did it again would be to try to loosen them but not too hard. After wiggling them around (they all flexed quite a bit) I would hit them with a punch again. I did it this way with the main bearing caps and, from what I hear they are prone to break also, none of those broke and came right out. I just noticed the price on that. I'm thinking I paid something like $60 for that off the truck but that was probably 8 years ago. I think Rigid actually makes the tool for them. You might want to check with them for a better price. I think this is what your referring to mcmillen. I've never had the guts to tear deep into an engine... well, I've also had no reason to except for my old car years ago and that was well before I was anywhere close to as comfortable working on stuff as I am now. I dropped the block off at a local machine shop yesterday and he said that he should be able to just hone out the cylinders and take out the bad spots. I'm dropping the head off today so they can do a valve job on it. FWIW ... If you want to draw more and more attention to the EXACT nature of your work... you might ask an Administrator or a Moderator to change the vague title you now have into being something solid and very specific to your Epic Efforts to Re-Build a GM Atlas LL8 Engine.. and then... just watch the flurry of interest and activity in your actions improve as a result. Please Remember.... WE CANNOT SEE WHAT YOU CAN SEE WITHOUT IMAGES.... So God willing... you will take the time to memorialise your work as you go along...in time...when you yourself need to go back to double check something you want to be sure of... you will thank yourself for this effort... and Thousands of Others out here on "The Internets"...will too. The easiest way to do this without having to micro-drop portions of your daily-weekly efforts... is to go to www.photobucket.com and set up a FREE, Publicly Accessible, 2 Gigabyte Account...and just drag and drop each daily batch of images into something called GMATLASREBUILD... or something like that... Then just drop the link to your account with each new post that has new images to view... and then everyone will be able to see what you have been up to! When I get started with posting pictures, I was thinking I would just start a different thread since this one is getting so long. I've never heard of using a special lubricant for head bolts. I have always just used new engine oil and put a vey light coating on the bolt. As far as the thread chaser goes, you can save yourself some $$ and make on out of one of the old head bolts. Just take an old bolt and cut grooves in it like a tap and now you have a thread chaser. I usually chase the threads then blow the hole it with air and then chase the threads again. I know that it is good when I can bottom out an unmodified head bolt by hand. It may take me a while to get everything organized but I will get something posted. I'm pretty busy this time of year. I work for a small college and I have about 30 vehicles to keep going by myself. On top of that, I drive their bus and right now the football team is gone about every other weekend. I am taking pictures as I go. I learned that a long time ago. It is especially helpful when you know that something is going to be taken apart for a while. As for beginning a Brand New Thread... I agree that if this is what you'd like to do... by all means, there will no harm in doing so...with the understanding that you have already created an interested audience based upon the fact that your "Likes Received" Numbers versus your Number of Posts are running at a ratio of greater than 1 to 1...which quite frankly, is almost an unheard of and a resounding success that seldom occurs on most forums. But... if the idea here is for you to have an uninterrupted stream of posts on a "Tabula Rasa" without any other input or guidance from others that you believe might distract or confuse what you are trying to say... Again... I will certainly respect your wishes to do it that way...and I'll leave the field that follows freely open to you as Virgin Mechanical Repair Land to navigate, cultivate and reap all of the accolades from when the time comes to Install and Start the New Rebuilt Engine for the First Time.. I just wanted to confirm with you that I have been making my postings here as the means to contribute towards a Total Stranger; whom I feel is now also my Brother in Arms for bravely attempting to do this rarely tackled Engine Rebuild. And so my comments and suggestions are meant to be benign, with the idea of trying to "yell out the presence of any "Mechanical Pot-Holes" you might encounter along the way... long before you "Break an Axle"...so to speak... Its This Damned Atlas Engine that prompts my over-abundance of Caution. Unfortunately... we have already had another Member document a Post-Mortem of his efforts to start a recently Completely Re-built GM Atlas 4.2L LL8 Engine that ended disastrously from having seized Connecting Rod Bearings that lunched the engine... because of not having Pre-Oiled the motor before starting it for the first time. Had he been posting his work here and there along the way...we might have been able to say something or suggest something to him that would have made a profound and positive difference in the outcome. I don't mind the comments and questions. I have a tendency to leave out information that I might think is a given. I do this especially if I have been mulling it over in my mind for several days and then I usually just skip to the conclusion and leave out everything in the middle and get funny looks from people when I try to explain something. Keep the comments coming! I've never experienced head bolts breaking off on anything else I've worked on. I have never worked on a 4.2 engine in this depth before either. 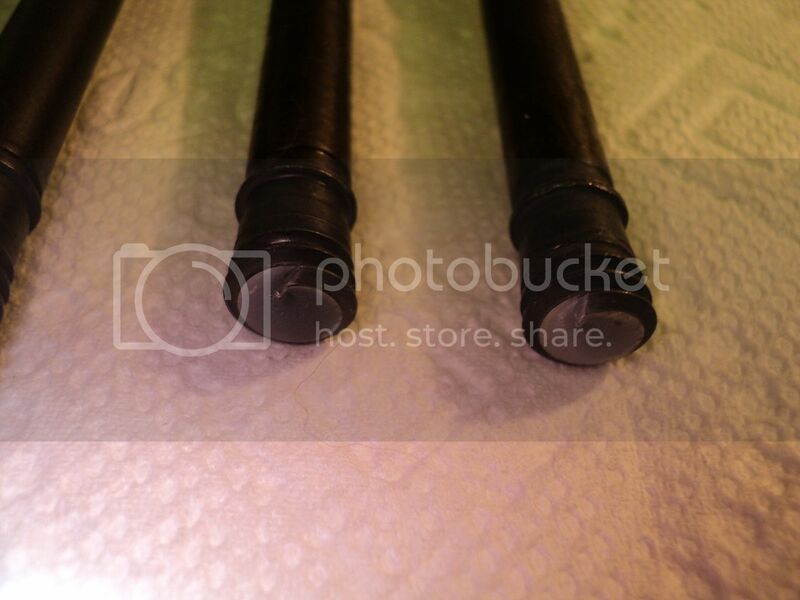 I attached a picture of the new and old head bolts. 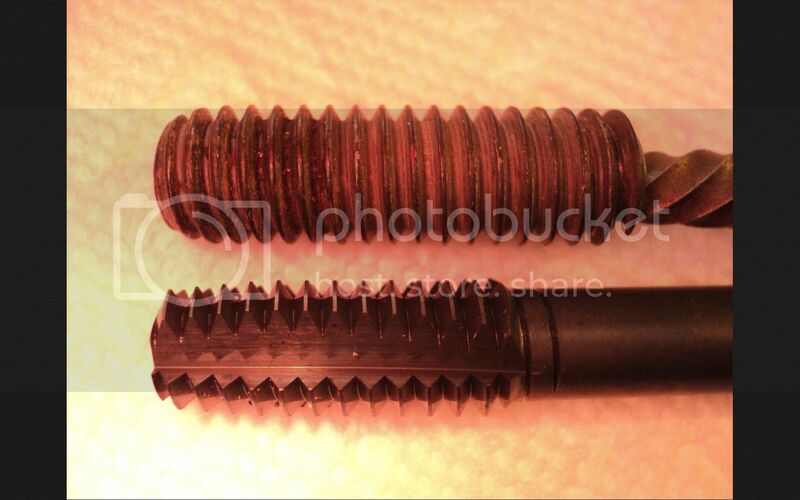 The head bolts that I bought are an "improved design" The bolt on the left is the old one and the bolt on the right is the new one. The bolts all broke just below the spot I circled on the picture. Just my opinion here but, I think they designed the bolt to where if it broke off, that it would break above the block and one could just take some vise grips and spin them out easily. When I took the old bolts out there was no resistance in the threads. I think they break because they're so long and maybe a little bit too small in diameter. The reason these bolts break is that once torqued and tightened to a greater "Degree of Angle" to get them within an "RCH" of parting... they thin down and crystallize at an atomic level that leaves them work hardened and brittle...or "TORQUED TO YIELD" which is just another way of saying they are very close to their Failure Point as soon as they reach the TTY Torque Angle. That is interesting. None of my bolts (not even the broken ones) show the signs of stretching like yours do. My old ones are even the exact length as the new ones. I learned a lesson the hard way once. I was changing some heads on an 8.2L Detroit engine and the manual didn't specify weather or not to change the bolts so I didn't. The engine ran a few weeks and then blew a head gasket. I bought new bolts and noticed something. I have a Snapon digital torque wrench that measures angle when you're done it will tell you the final torque of the bolt. The new bolts, that had never been stretched, had a much higher final torque probably about 50 ft. lbs. more. The bolts definitely get weaker when they stretch even if they do shorten back up when the stress is taken off them. I have always replaced the head bolts on everything since that incident. That was probably one of the first heads I had ever replaced. I learned a lot during that job. No doubt. That engine was really crammed in there. It was so tight in there that there was a panel under the floor mat that had to come off so I could get the push rods out through the floor board. Re-work is the worst. I bought them from Rock Auto but you can also buy them at any parts store that sells Fel-Pro products. I have the ES71334. The old design is ES72195. Okay... eBay... had the Best Price & Availability with Free S&H today... Thanks! @m.mcmillen ...if you don't mind indulging this information that follows... this is only tangentially related to this present event… but it is an important idea for the Post Readers following along with the developments about your rebuild to appreciate. Someone has already explained Why having photos and videos on hand during complex or hard to diagnose RFH events (Request For HELP!) is of paramount importance. ...at first, @02i6Danger was unable to figure out what might cause his engine to leave what looked to him like the Metal Fragments of a Bearing inside his Intake Manifold of all places… and when it came time for the required Engine Tear Down… He was good enough to follow up on the matter and did so by Recording A Youtube Video that described the Terrible Cause and Origin of his mechanical difficulties for others to see and learn from. As it was coined originally by @Blckshdw … “Carlton’s Expression” as I like to think of it... should be principally emblazoned across the top of every new post involving any ”Request for HELP” because in an age where EVERYTHING is either being photographed or videotaped or “selfied”… there simply is NO Excuse for people NOT to bring their Multimedia Documentation right along with their Desperation to Get Their Problems Solved. And so… Genuine Thanks go to Danger for sharing this startling and revelational piece of GM Atlas I6 Engine Cinema! And the added thing worth mentioning after viewing this video is that it looks like Danger's Anti-Freeze is GREEN instead of being the expected DEXCOOL ORANGE... Could that have played a role in the events leading up to the engine failure? Its just an observation, mind you.. but a PERFECT illustration here that it would be impossible to consider this Diagnostic Question ...if we Don't get to see Danger's Video! Small update...I haven't stopped working on this. I'm waiting for the machine shop to finish up with my block and head. I talked to him Monday and he said to give him a week to get to it. There are not many places to go out here where I'm at. The local shop told me it would be a month before he would work on it. I went to another town about 20 miles from here. Hopefully, I will hear something next week. I meant to ask you about the complete, laborious swap-out you performed on the R&R of the Roller Rockers and Valve Lash Adjusters... Is THIS the Tool that you used...and what was your reason for doing all of them? I pulled the cams and changed them out. I changed them because a couple adjusters had collapsed and I figured if I was going through the trouble of doing all of that work I would change them all. I went and picked up my engine block today. It turned out pretty nice. The shop was able to hone the cylinders and be able to keep the standard size. I did a little bit of cleaning on it this afternoon after the pictures. Hopefully tomorrow I can start putting the bottom end back together. The head should be all done tomorrow, I think. Remarkable... You do realize, don't you... that you have just posted what must be THE ONLY Images in existence... outside of a GM White Paper ... that shows what the "Bare Bones" of the GM Atlas 4.2L LL8 Engine actually LOOK like..Deeps Inside...Right? Who knew that the Crankshaft Cradle had all those Stainless Steel Alignment Cylinders! Keep them coming, Brother! Every single thing you show... Every Step you describe in exquisite visual detail will be added to the past, present and future Lexicon of How to Re-Build this amazing I-6 Engine. And as much as I admire the handiwork of the Machine Shop that performed this Rescue of The Block... I would study the contents of every smidgen of Dirt and Metal extracted out of every Bolt Hole very carefully when double-cleaning and Thread-Chasing-Checking each one along the Crankshaft Grid with a Very Jaundiced Eye... as the New TTY Fasteners are also known to snap off during assembly as well as when they must get removed. I gave it a good cleaning last night. I was surprised at how much junk came out of the bolt holes for the head bolts. I chased them several times and sprayed brake cleaner in there and then blew them out with air. After I did that, I chased the threads again. I didn't get anything out of the holes on the last pass so I think they're good now. I was hoping to at least get the crankshaft installed last night after dinner. I went over and started working away and realized that I had forgotten to buy some assembly grease. I just went and picked some up so hopefully I can get going on it again today. The lift is rated for 14,000 pounds. It is nice to be able to drive the plow truck up on there and not have to worry about taking the plow or the salter off to work on the truck. Sure looks like they put a lot of thought into making that engine to make sure it always goes together square. I know they use TTY stuff a lot, but I know a lot of aftermarket engine builders will use "normal" bolts like ARP studs and such. Is that an option for this? I don't really know the pros and cons of each, I just know I like reusable stuff and was really happy my Camaro had the stock TTY rocker arm bolts replaced with reusable bolts by the previous owner when I had to replace the valve springs.